That's an anchor at a local TV station owned by Sinclair, describing the company's latest mandate, a promotional campaign that sounds like pro-Trump propaganda. Internal documents call the new initiative an "anchor delivered journalistic responsibility message." But the staffers who shared the documents with CNN say the promos are inappropriate -- yet another corporate infringement on local journalism. The promo requirements are the latest reason why some Sinclair journalists are upset with the company's Maryland-based management. In recent years Sinclair's owners, the Smith family, have made several programming decisions that reflect a right-wing agenda. Most noticeably, pro-Trump commentaries by former Trump aide Boris Epshteyn have cut into local news time. Local journalists have also bristled at so-called "must run" packages about subjects that aren't relevant to local audiences -- but are hot-button stories for conservatives. The "Terrorism Alert Desk" is a regular segment about security threats around the world. Sinclair's political bent has been a factor in its pending acquisition of Tribune Media. Sinclair is already the biggest owner of local television stations in the country -- with 173 it either owns or operates -- and Tribune will give it dozens more, furthering the company's ambitions. Some analysts believe Sinclair wants to rival Fox News, although officials at Sinclair have rejected those suggestions. The FCC is currently reviewing the Tribune deal. Sinclair critics -- Democratic lawmakers and some of the company's Republican rivals -- have alleged that the FCC has given Sinclair preferential treatment. With all that in mind, these mandated promos show how the company wants to position itself in local markets from coast to coast. The instructions to local stations say that the promos "should play using news time, not commercial time." Like the Epshteyn commentaries, this takes away from local news time. 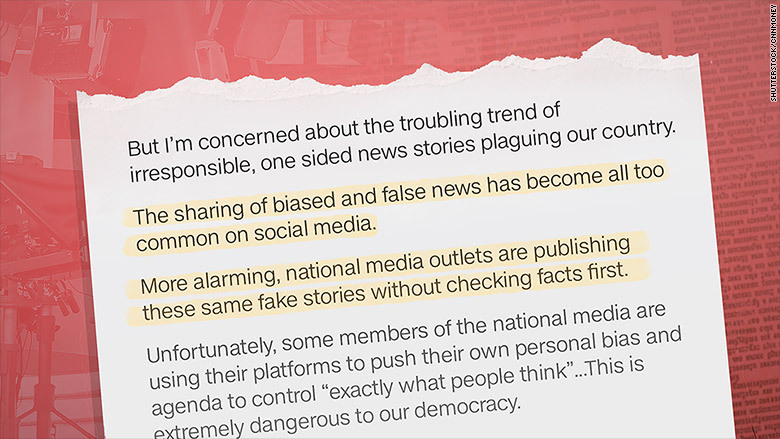 "The sharing of biased and false news has become all too common on social media," the script says. "More alarming, national media outlets are publishing these same fake stories without checking facts first. Unfortunately, some members of the national media are using their platforms to push their own personal bias and agenda to control 'exactly what people think' ... This is extremely dangerous to our democracy." On its face, some of the language is not controversial. But that's precisely why some staffers were so troubled by it. The promo script, they say, belies Sinclair management's actual agenda to tilt reporting to the right. Scott Livingston, the company's senior vice president of news, read an identical promo script last year. The promo was aired on Sinclair's stations, and this new initiative is an apparent follow-up. "Promo messages, like the one you are referring to, are very common in our industry," Livingston said in a statement to CNN on Tuesday, prior to publication of this article. "This promo addresses the troubling trend of false stories on social media [Livingston's emphasis], and distinguishes our trusted local stations as news destinations where we are committed to honest and accurate reporting. This promo reminds our viewers of this mission." After this story was published, Livingston sent CNN another copy of the script. It had one big difference: The word "national" was missing. Instead, it said "some media outlets" publish "fake stories." The rest of the language remained the same. Livingston said this script was "distributed yesterday to our stations." He declined to answer other questions on the record. The instructions for producing and airing the localized versions went into great detail about how the promos "should look and sound," according to another document obtained by CNN. 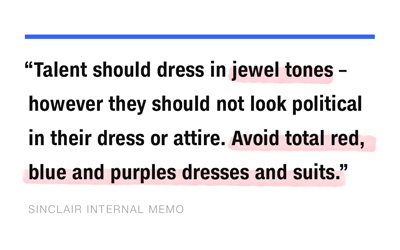 "Talent should dress in jewel tones -- however they should not look political in their dress or attire," one of the documents says. "Avoid total red, blue and purples dresses and suits. 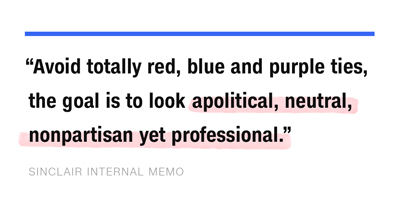 Avoid totally red, blue and purple ties, the goal is to look apolitical, neutral, nonpartisan yet professional. Black or charcoal suits for men...females should wear yellow, gold, magenta, cyan, but avoid red, blue or purple." At the end of the promo, viewers are encouraged to send in feedback "if you believe our coverage is unfair." The instructions say that "corporate will monitor the comments and send replies to your audience on your behalf." In other words, local stations are cut out of the interactions with viewers. Management will handle it instead.